This is a USA swap only. Feel free to host an International version. Abandoning art or crafts is so fun to do. It will brighten someone's day. There are Facebook groups and other groups around the world. Do a search to find out more. For this swap you will send your partner an art or craft item you have made or you can pass along someone else's art/craft that you may have. 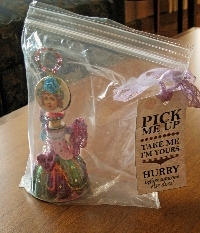 As in swap image, put the art/craft in a baggie and add a tag stating that it is Art/Craft Abandonment - either printed or handwritten - again do a search to get ideas on what to write on your tag. When you received the item from your partner you will abandon the item. Some places are in a library, restaurant, park bench (weather permitting), the mall, etc. NEW as of March 2018 I was informed by my sister, who works in a store, that their store policy is: If something is found on the shelves that is not sold in the store then the employees are required to throw it away. I asked her "What about the bathroom?" and she said there was no policy about the bathroom. I'm not sure if all stores are this way, but I will no longer be abandoning art on store shelves. I have put Art/Crafts in the bathroom on the paper towel dispenser or if there's a large sink or table in there. Remember to rate when you receive and go to your partner's profile page and post a comment to the page where you abandoned their art/craft. Newbies welcomed, with a well filled out profile (I DO CHECK AND WILL BAN). Because of delivery issues, multi-profiler/flaker concerns, and site policies I require real names. If you join a swap of mine with a fake name or no last name, you will be asked to fix it. No recent/unexplained low ratings and you must check into swap-bot within 3 days of partners being assigned. PLEASE check out my profile page and read the "About Swaps I Host" section for an in-depth explaination of my swap rules. Also ~ I live in "Boonyville" Michigan and sometimes our internet connection isn't very good. This is especially true when it rains & in the winter months. I have been told that swap hosts have 7 days after the sign up date to assign partners. So please be patient, partners will get assigned and if needed I will extend the send date. If you know of a bad swapper signed up for this swap, I appreciate being informed, but please DO NOT post to the comment section! Send me a PM and I will deal with it that way. I have an e-mail that I use for Abandonment only. I have heard from several "finders". The best e-mail I received was when I left a crocheted carnation in the hospital when I went for some tests. The woman that found it said her Mom had just died at the hospital. She found it as she was leaving. Carnations were her Mom's favorite flower. She took it as a sign from Mom that everything will be OK. I host this often and hopefully you'll be able to join in the future.